Line a 28 x 20-cm (11 x 8-inch) pan with plastic wrap. Set aside. In a large pot of salted water, cook the potatoes until very tender. Drain well. With a masher, purée the potatoes. Add the cheese, chicken, and one egg and stir to combine. Season with salt and pepper. Spoon into the pan and press evenly. Cover with plastic wrap and refrigerate for at least 3 hours. Preheat the oil in the deep fryer to 190 °C (375 °F). Line a baking sheet with paper towels. Place the flour on a plate, the three remaining eggs, lightly beaten, in a shallow bowl and the breadcrumbs in another plate. Unmould the chilled mixture on a floured surface and cut into 36 sticks, 6 by 6. Flour the sticks and shake to remove any excess. Dip in the egg mixture and drain. Press in the breadcrumbs to coat. Fry 6 to 8 sticks at a time in the oil for about 2 minutes or until golden brown. Drain on the baking sheet. 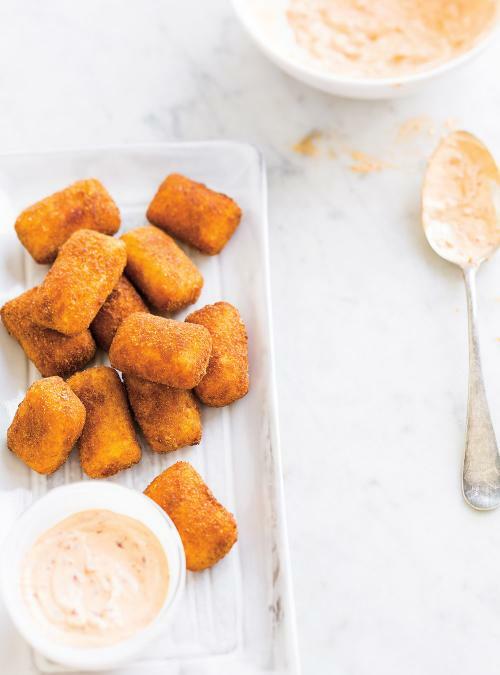 Serve immediately with Sundried Tomato Mayonnaise or freeze. 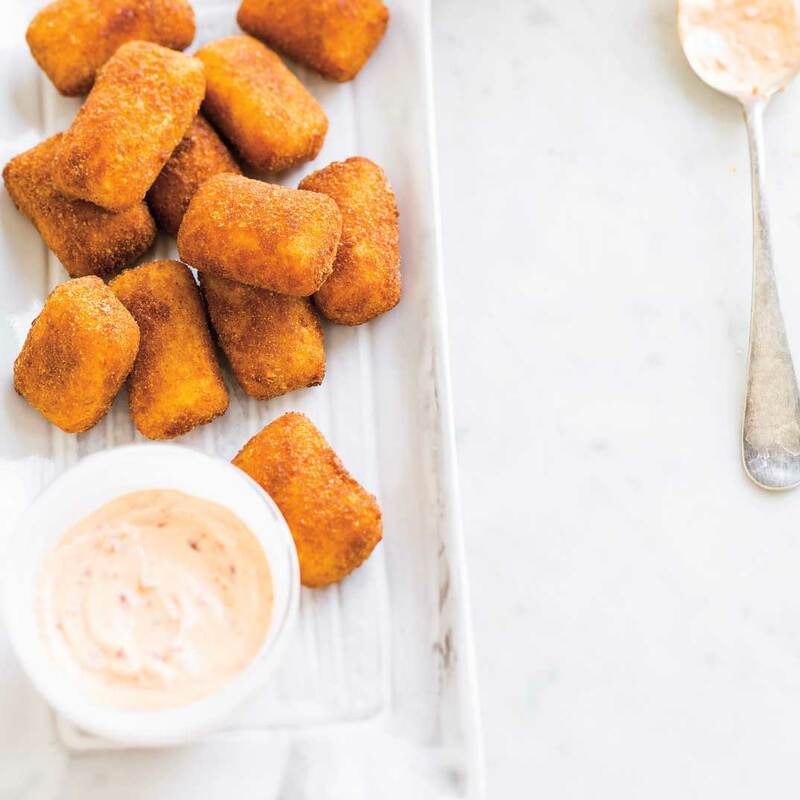 To serve frozen pre-cooked sticks, reheat them for 15 to 20 minutes on a baking sheet in the center of a 180 °C (350 °F) preheated oven. Login to rate this recipe and write a review. Not a member yet? Sign up today, it's free! Due to the large number of questions we receive, we are unable to answer each one. Please visit our Frequently Asked Questions section, which contains a great deal of useful information. We appreciate your enthusiasm for RICARDO cuisine! You must leave a comment! Your comment must comply with our netiquette. Garlic: remove the sprout or not? Try our newest recipes that can be whipped up in our RICARDO electric pressure cooker! From recipe videos to kitchen how-tos, let Ricardo and his team help you become a kitchen pro! Treat mom to a memorable meal with our selection of tasty recipes for Mother’s Day. Shop our kitchen tools, tableware, linens and more, all at the click of your mouse! 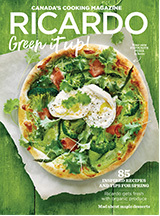 Subscribe to Ricardo's FREE newsletters to receive handpicked seasonal recipes, menu ideas, cooking tips and more. Recipes with the "Healthy Pick" stamp have been evaluated by a registered dietitian member of the Ordre professionnel des diététistes du Québec. Signup today, it's free ! Connect using your Facebook profile. Information will not be posted to Facebook without your permission.